Admission: 20 DKK, children 5 DKK. Please put your payment in the money box or pay by MobilePay. If you want a guided tour please contact info@fondengamlesonderho.dk or phone +45 5150 1850. The fire engine museum was originally established by Jørgen von Hahn. In 2003 the museum was taken over by Fonden Gamle Sønderho with financial support from Købstædernes Forsikring. The fire engine is a land engine from Schackenborg from 1895. It is of the same type as the original fire engine from 1868. The old fire engine house was originally owned by the municipal of Fanø but Fonden Gamle Sønderho bought the building in 2011. The old fire engine house is one of the oldest and best preserved in Denmark. In addition to the old fire engine from 1868 Jørgen von Hahn has collected exhibits and notes which gives a good impression of the fire protection of the time. 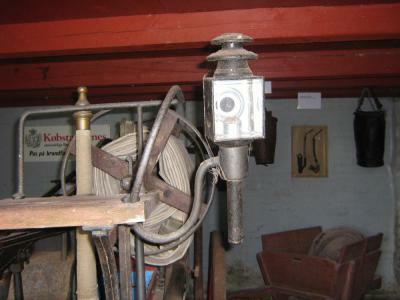 The museum represents an important stage of the development of fire protection in Fanø and in Denmark. Therefore, the collection is worth preserving. 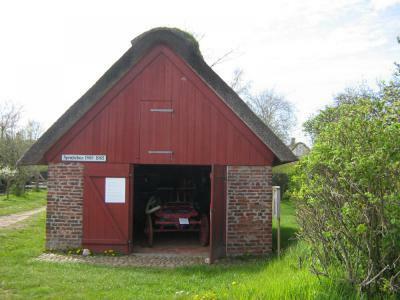 The old fire engine house is a three-bay brick-built thatched building centrally placed in the old housing in Sønderho. The house has wooden gables with hatch and a gate with two leaves. Sønderho has today a modern and efficient fire service. It is important to preserve the fire museum as part of the village and as a reminder about the risk of fire in Sønderho. Other fire engine museums: Jysk Brandmuseum in Kjellerup. 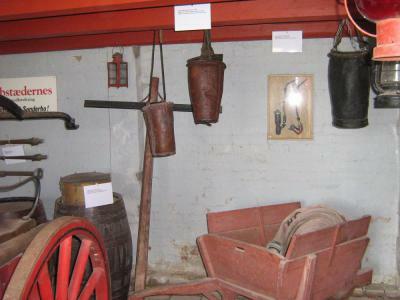 Until 1868 no common fire protection equipment was available in Sønderho except since 1805 fire hooks, ladders and leather buckets places at strategical locations in the village – in Vester Land, in Narland, at the Church and at the school. When signing a fire insurance the house owner committed himself to arrange convenient tools for fire protection. The tools including fire hooks, ladders and leather buckets were checked by taxation men who should appraise the house. The most important fire protection tool was the fire hook to be used to tear down burning straw from the roof and thereby preventing the fire to spread to the roof construction or nearby houses. Taking into account that most of the houses have thatched roof they are located very close to each other. In case of fire the risk of spreading the fire is high when burning straw fly with the wind to nearby houses. Obviously, the vigilance has always been great. In old days the sailors were brought up with carefulness with fire at sea and they brought this practice home. In 1743 it was stated that pipes should have a lid for outdoor smoking. that the fire will not be willful. In old times people often stowed old sails in the loft. The sails were moistened and put on the roof in case of fire in a neighbor house. By this way the fire was prevented to spread and thereby, the village is still well preserved. Julius Exner: Fire in Sønderho July 5 th, 1900. The first fire engine was acquired in 1868 and it can be assumed that the parish council bought the house no 186 at the same time. The engine was a land fire engine made by Knudsens Fabrik i Odense, price 175 rix-dollar. Later a 24 feet canvas pipe was ordered at a price of half a rix-dollar per feet. A fire regulation for Sønderho was put in effect in 1868. The fire service included different tasks: Command, Rescue, Breakdown, Engine and Water supply. Each task was held by dedicated persons. Before the fire engine was acquired in 1868 there was already in 1805 established a private night fire watch regulation. The night fire watch regulation includes detailed conditions for watch timing, manning, procedures, tools and punishment in case of non-performance. Three fire night watchmen patrolled in Sønderho every night from 22 to 6 in the morning on 4-hours watches. This means that each house could be checked every hour. Baking bread was not allowed during night. By this means the people in Sønderho looked after their thatched houses until 1890 when a public fire night watch was established. The fire manager in command could ask people to assist in firefighting as he found it necessary. The people in Sønderho had great respect for thunderstorm. According to the fire regulation the fire staff should meet at the engine house after the third thunderclap and stay until the thunderstorm was blown over. Transport of water from a well or from the sea to the fire was organised by women. Young girl in a line passed full buckets from hand to hand and older women returned the empty buckets. 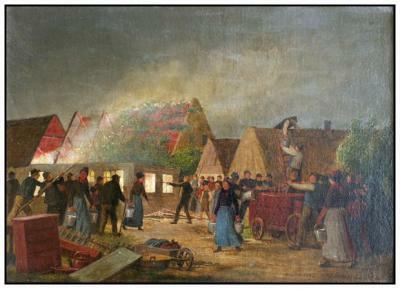 The artist Johan Julius Exner has vitalized the drama in his oil painting Fire in Sønderho July 5th 1900 which can be seen at Fanø Art Museum in Sønderho. The original fire engine from 1868 is shown at the painting. The risk of fire has influenced the design of the typical Fanø house. The hatch opening in the thatched roof (“arkengaf”) is typically located above the entrance door. Thereby, the arkengaf prevents burning straw to block the door.